Something strange happened the other day. As we were closing up our New Jersey HQ for the evening, we overheard five of our machines talking about their goals for 2018. Here is the conversation in its entirety. NHP: Thanks for coming, everyone. As you know, the holidays are here. It’s time for some well-deserved rest after a great year. DNM, PUMA, DCM, and LYNX: Hooray! NHP: Just kidding. We do not take breaks here. At Doosan, we know that just because we’re world-class doesn’t mean we can’t improve. So with that in mind, I want you all to create your goals for 2018. DNM: Can you lighten up, NHP? The company holiday party just started and the Mynx said she’d save a dance for me. NHP: Thank you for volunteering, DNM! What is your goal for 2018? DNM: Keep being me. I’m perfect. DCM: LOL THAT IS AN EXCELLENT JOKE, DNM. NHP: Hey, uh, DCM? Can try to keep your voice down? LYNX: Lemme guess. You are very big. DCM: I AM VERY BIG, YES. LYNX: Why do you always have to rub it in? NHP: Whoa. It’s okay, LYNX. I don’t think it was a shot at you. In fact, I don’t think DCM has insulted anyone in his entire life. LYNX: Well, I’ve got my resolution. And I’ll raise my voice so everyone can hear me. IN 2018, I WILL OUTPRODUCE ALL FOUR OF YOU TRY-HARDS. DCM: LOL THAT IS AN EXCELLENT JOKE, LYNX. DNM: That’s adorable. You’re adorable. Our own little Napoleon. LYNX: I have no idea who or what that is. NHP: We’re veering off track. PUMA, please save us. What’s your 2018 goal? PUMA: Probably to remain a multitasking master. By the way, while you’ve all been talking, I took the liberty of documenting all your goals, finishing up these aerospace parts I was working on, and baking a batch of delicious cookies. Here you go, LYNX. LYNX: If you think for one second a little food will calm me down, you’ve got another—oh hang on. Oh wow. That’s actually really good. NHP: PUMA, as always, I love your productivity. But can you please not feed us sweets? You know we prefer chips. PUMA: Right. My fault. Holiday spirit and all. NHP: Understandable. DCM, what’s your goal? DCM: TO CONVINCE PEOPLE THAT I EXIST. LYNX: What?! You’re massive! What kind of a goal is that? DCM: IT IS AN IRONIC PART OF WHO I AM. DESPITE MY SIZE, MANY DO NOT KNOW WHAT I CAN DO. DNM, LYNX, PUMA, NHP…THESE ARE ALL RECOGNIZABLE AND DARE I SAY FAMOUS NAMES. MY GOAL IN 2018 IS TO BECOME AS WELL-KNOWN AS MY TALENTED BROTHERS. DNM: Can I say I just love this loud-talking monster? LYNX: Yeah, he’s all right. Hey NHP, what about you? You never told us your goal. NHP: Oh, that’s easy. I’ll make my owner buy more chip bins. 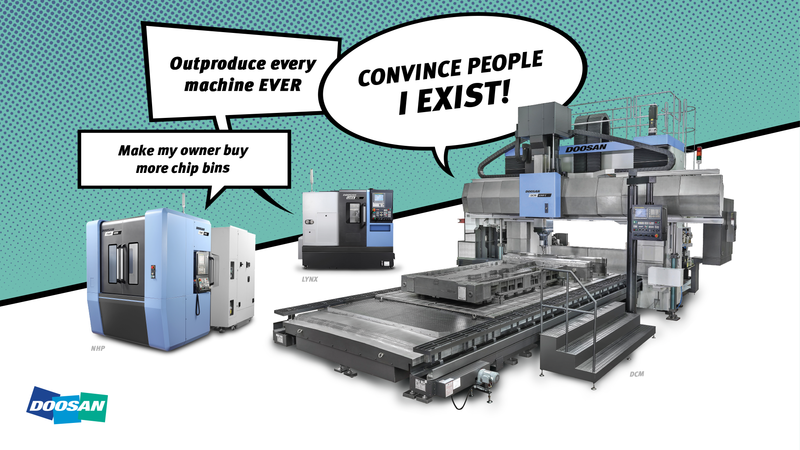 I’m never, ever going to stop machining. No breaks. No offseason. Just pallet after pallet. DNM: Wow, are you insufferable. I’m going to the party. DCM: I WILL BRING THE CHIPS. NHP: Oh, come on! I already made that joke! DNM: It’s all about the delivery, man. You’ll learn someday. PUMA: It’s okay, NHP. Your joke was good, too. Here. Have a cookie.